BOTHELL, WA, Nov. 13, 2018 (GLOBE NEWSWIRE) -- Cocrystal Pharma, Inc. (NASDAQ: COCP), (“Cocrystal” or the “Company”), a clinical stage biotechnology company discovering and developing novel antiviral therapeutics that target the replication machinery of hepatitis viruses, influenza viruses and noroviruses, announced today that Sam Lee, Ph.D., President of Cocrystal, presented at the 6th ISIRV-AVG Conference, Advances in Respiratory Virus Therapeutics, being held November 13-15, 2018 in Washington DC, USA. Dr. Lee’s oral presentation, “Preclinical characterization of CC-42344, a broad spectrum, potent influenza A strain PB2 inhibitor for potential triple route (oral, inhalation, and IV) treatment,” discussed CC-42344, the Company’s lead molecule currently being evaluated in preclinical IND-enabling studies for the treatment of influenza. CC-43244 binds to a highly conserved PB2 site of influenza polymerase complex and exhibits a novel mechanism of action. To access Dr. Lee’s presentation, please click here. Cocrystal is developing novel, broad spectrum influenza antivirals that are specifically designed to be effective against all significant A strains of the influenza virus and to have a high barrier to resistance due to the way they target the virus’s replication machinery. Cocrystal’s uniquely developed molecules target the influenza polymerase, an essential replication enzyme with several highly essential regions common to influenza strains, including pandemic strains. The ISIRV is an independent and international scientific professional society promoting the prevention, detection, treatment, and control of influenza and other respiratory virus diseases. ISIRV was founded in 2005 as the first scientific society with a fully worldwide remit focused on influenza and respiratory virus disease. A particular stimulus for its creation was also the need for an organization to ensure continuation of the Options for the Control of Influenza conferences which were growing ever larger. Influenza and acute respiratory virus disease is a field of public health of major international importance. Recent epidemiological events - the 2009 pandemic of H1N1 influenza, first identified in Mexico; the occurrence of human cases of avian influenza A (H7N9) in China; the emergence of Middle East Respiratory Syndrome (MERS-CoV); and ongoing outbreaks of virulent avian influenza A (H5N1) in several countries; continue to highlight the requirement for international collaboration on respiratory virus research and development. 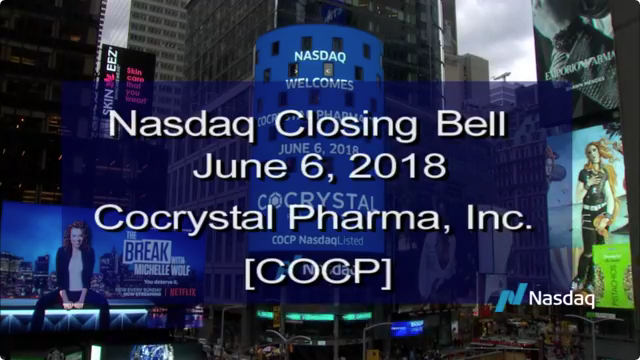 Cocrystal Pharma, Inc. is a clinical stage biotechnology company discovering and developing novel antiviral therapeutics that target the replication machinery of hepatitis C viruses, influenza viruses, and noroviruses. Cocrystal employs unique structure-based technologies and Nobel Prize winning expertise to create first- and best-in-class antiviral drugs. CC-31244 is a broad-spectrum novel non-nucleoside replication inhibitor of the hepatitis C virus. Phase 1b studies in HCV-infected patients showed the largest reduction in viral load of any non-nucleoside inhibitor tested to date. CC-31244 is now in a Phase 2a clinical trial as part of a cocktail for the ultra-short therapy of 6 weeks. The Company’s lead candidate CC-42344 for influenza is effective in animal models against both the pandemic and seasonal strains of influenza A. In addition, novel inhibitors effective against both influenza strains A and B have been identified and are in the preclinical stage. Several of these have potencies approaching single digit nanomolar. We continue to identify and develop non-nucleoside polymerase inhibitors for Norovirus infections using the Company’s proprietary structure-based drug design technology platform. For further information about Cocrystal, please visit www.cocrystalpharma.com. This press release contains forward-looking statements within the meaning of the Private Securities Litigation Reform Act of 1995, including the results of our Phase 2a clinical trial. The words "believe," "may," "estimate," "continue," "anticipate," "intend," "should," "plan," "could," "target," "potential," "is likely," "will," "expect" and similar expressions, as they relate to us, are intended to identify forward-looking statements. We have based these forward-looking statements largely on our current expectations and projections about future events. Some or all of the events anticipated by these forward-looking statements may not occur. Important factors that could cause actual results to differ from those in the forward-looking statements include the evaluation of the results of the Phase 2a study, the availability of products manufactured by third parties and receipt of regulatory approvals. Further information on our risk factors is contained in our filings with the SEC, including our Quarterly Report on Form 10-Q for the quarter ended September 30, 2018, the Prospectus Supplement dated April 30, 2018, and our Annual Report on Form 10-K for the year ended December 31, 2017. Any forward-looking statement made by us herein speaks only as of the date on which it is made. Factors or events that could cause our actual results to differ may emerge from time to time, and it is not possible for us to predict all of them. We undertake no obligation to publicly update any forward-looking statement, whether as a result of new information, future developments or otherwise, except as may be required by law. © 2019 Cocrystal Pharma, Inc.